TTC: It’s OK if You Don’t Feel Pregnant (yet). Disclaimer: Everything contained in this post is my own personal opinion and should not be mistaken for medical or any other type of advice. Many women agonize over each and every “symptom” of pregnancy. Starting from the day of ovulation we are waiting and waiting for that feeling. Most women of childbearing age will have heard “You’ll just know” when your pregnant. We can be so hopeful to conceive that any tiny day-to-day occurrence that is slightly abnormal becomes a symptom. This is called “symptom spotting”. This behavior is common and even expected in many TTC forums and for women TTC in general. But is it helpful or hurtful?? I have been TTC for multiple years, I’m strongly leaning to its not helpful, and could be hurtful. Depending on your psyche and personality style. I believe this is a vastly personal decision that should be made, whether to actively symptom spot during your 2ww or not. It does seem to be expected, but I’d like to bring more awareness to why maybe this isn’t such a healthy or helpful practice. In our current society we look to the internet to gain information and answer questions. The TTC community is vast, and there are archives and archives of forums where women that have gone through the exact same thing, dating back almost a decade. You can read everyone’s personal anecdotal evidence that yes someone with the exact same “symptoms” as you got their BFP (in 2009? damn that was a long time ago..I’m getting old!). But there will also be the other side represented too, where someone will state the same symptoms and not update with a BFP — but they never went back and said “Hey it’s me I actually wasn’t pregnant.” So we ignore that thread and cherry pick our information. Many many women become pregnant with no early symptoms. The most common “first symptom of pregnancy” is a missed period. Accept this, embrace this. Allow yourself not to feel pregnant. It doesn’t mean that you’re not about to get that BFP, it just means that you’re normal! Research shows that most pregnancy symptoms begin 4 – 6 weeks in, that’s after your missed period. I know we want to rush through the tough parts and just get to the prize at the end, but pregnancy cannot and should not be rushed! You will feel pregnant, you’ll just know. – This is my biggest myth I am trying to let go of. In the 2ww I feel normal, I don’t feel anything special until maybe a day for 2 before AF. So I feel like I frequently “scan” my body for anything that might be amiss. I’ve read it a million times how people just know and people have x y & z symptoms on CD 7,8,9,10 ++. So I feel less hopeful comparing myself to others, I feel like I’m missing something, I feel like there has to be something I can feel. So I’ll feel a twinge, or see some CM, or notice a mood or tiredness, to give myself some hope. Deep down I know it’s probably nothing, but I try not to let myself know that I know that its nothing. It’s completely ridiculous trying to keep a secret from yourself. This is not helpful to me. It makes me feel more stressed about TTC that comforted. 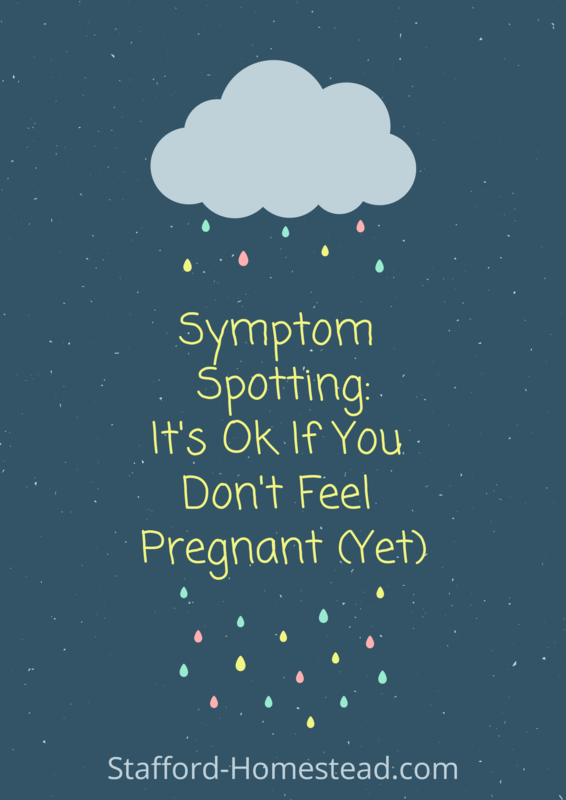 If we come back to reality for a minute, and think about how ridiculous it is to “feel” symptoms before pregnancy has even occurred, maybe I can stop myself from feeling this way. Conception occurs inside the body on a cellular lever, just one cell is from your body, the ovum, and it has been released into the fallopian tube. HOW on God’s green earth could you possibly “feel symptoms” from 1 free-floating cell?? from Ovulation to implantation you have no control, your body could not possibly know if conception has occurred. The feelings that you feel are from a chemical change after ovulation that causes a cascade of hormones that lead up to either pregnancy or AF, From 0 DPO to implantation all of the information your body receives (in form of hormones) is exactly the same. If you don’t believe you’re pregnant it won’t happen. I think this is another hurtful concept that is pushed onto women who are TTC. It’s suggested that you need to will yourself to become pregnant. If you have too much negative energy it can prevent pregnancy. Although I get the idea of “self-fulfilling prophecies” adding this idea to my “getting pregnant” plan just adds extra stress. I don’t believe there is any evidence based research proving or even suggesting that this is true. It is definitely an “alternative” therapy idea. If this idea makes you feel empowered and relaxed/positive then more power to you. To me it just feels fake, forced and makes me feel guilty that I don’t truly believe it. I am still positive, but I am not overly confident and convince myself that “I am pregnant”. I have many times convinced myself that I was pregnant (usually because of false symptom spotting) I found these BFN much more painful. Obsessive testing – wether it be OPKs or HCG I don’t allow myself to go wild with testing. It’s not helpful, and frequently is hurtful. When its ovulation time, I take 1 test per day, at the same time until I get a positive. I don’t keep testing or test 2 -3 x per day. HCG early testing is inaccurate and an expensive hobby that just tears your heart apart. Why torture yourself? I used to start testing religiously from CD 10 to 14, now that I have implemented some ground rules on testing I feel much better during the last hard days of the 2ww. 5 more days until I find out BFP or IVF. I’m really hopeful and optimistic that it will be a BFP. Lots of other people announcing their pregnancies recently is always very bittersweet, hopefully I can join them soon. Previous Beginner Beekeeper: Installing a Nucleus Hive. Next Infertility and The In-Office Hysteroscopy: Is it painful?